September is wine picking season in the south of France... better know as the VENDAGE. The fields are plump with raisins, purple, green, cote du rhone, merlot, syrah, grenache noir hiding behind the scarlet and golden foliage. On our fall walks, the skinny tractors that fit between the vines ramble along the road with their big funnel baskets and octupus like arms. The smell of the grapes being crushed passes through the air as we walk by one old family farm. An old stone barn, an old tractor, and some shiny new wine making machinery. For many however, the vendage is comleted au naturel, by hand. What this means is lots of volunteer labor; friends, family, and foreigners, and some cheaply paid students. For days and weeks, you can see crouched groups of people, covered in straw hats, bandanas, and hiking boots bent over in a continuous stoop of cutting the grapes. You want them just right, plump but not too dry. This year we were invited by an American couple who are pursuing the dream of living off the land to join in the vendage. Young and industrious he has a day job with corporate Europe and she is the farmer and wine maker. On a bright sunny September day we joined a group of people, clippers in hand and ventured out to meet the grapes face to face. 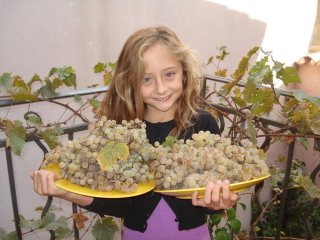 Once we got back home, we all realized that we had to conduct our own vendage with our lush terrace grapes. Two heaping plates of green sweet grapes. Zoe said she'll stomp them this week and see what we can make.